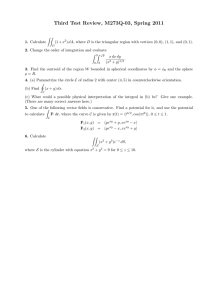 This is a more formal development of the formulas for the volume and surface area of a sphere. coincides with the upper base of the cylinder and the apex lies on the lower base. 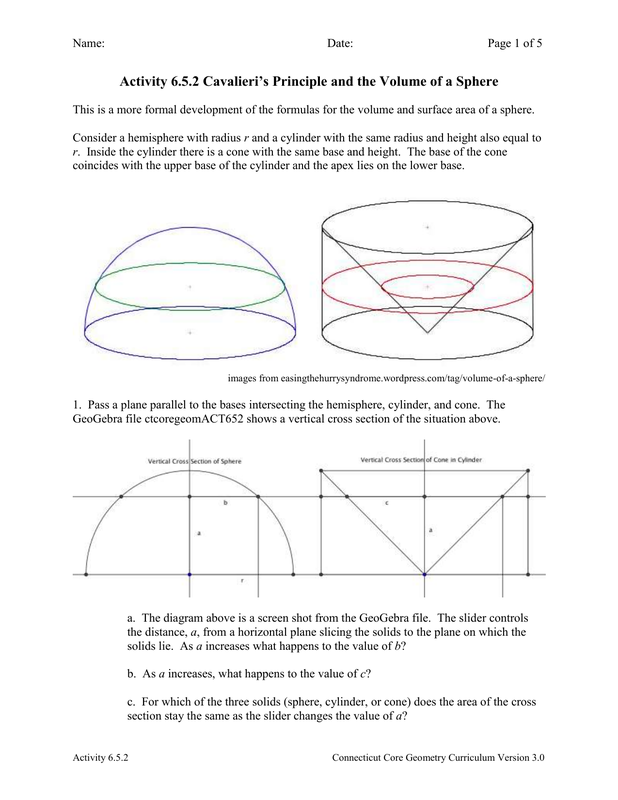 GeoGebra file ctcoregeomACT652 shows a vertical cross section of the situation above. solids lie. As a increases what happens to the value of b? b. As a increases, what happens to the value of c? section stay the same as the slider changes the value of a? the hemisphere (on the left)? b. What happens the area of the inner circle on the right? of the hemisphere is equal to the area of the annulus. a. In the diagram we see that a2 + b2 = r2. Why? b. We notice also that ∆DCB is an isosceles triangle Why? c. We also notice that triangle EFB is similar to ∆ DCB. Why? 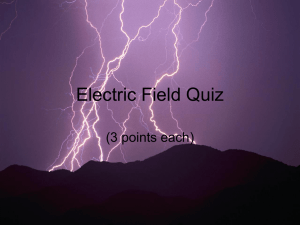 d. This leads us to conclude that since DB=DC, a=c. Why? e. Use the results in (a) and (d) to show that b2= r2 - c2. ____________ minus the cross-sectional area of the __________________. g. Applying Cavalieri’s principle, what can we now conclude? State this as a theorem. 4. 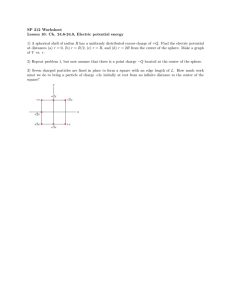 What about the surface area of the sphere? 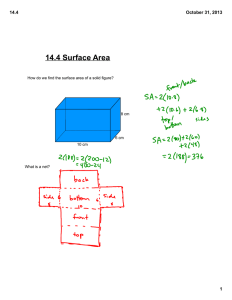 Let S represent the surface area. volume of 3 ∙ 𝑛 𝑆 ∙ r.
a. Find the volume of n of these cones. b. Set the volume of n cones equal to 𝜋𝑟 3 , which is the volume of the sphere. c. Solve the equation in (b) for S.
your experiment with the orange? the cylinder is twice its radius. a. 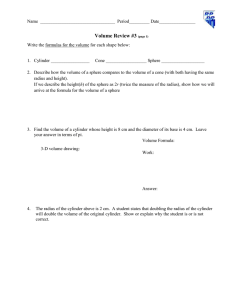 Find the volumes of the sphere and cylinder. is the same. Show that he was correct. 6. Here is another proof of the formula S = 4πr2, based on Archimedes’ cylinder and sphere. strip on the sphere is hs. a. 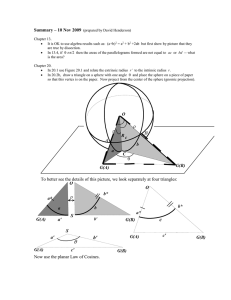 Show that the area of a strip on the sphere is 2πrhs. b. Show that the area of a strip on the cylinder is 2πRhc. = R and QP = r. AP = hs and AB = hc.. Show that 𝐾𝑃 = 𝐴𝑃 . of the strip on the cylinder. 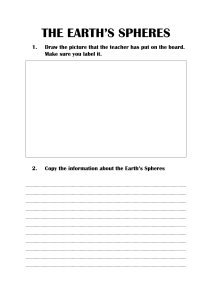 e. Complete the proof to show that the surface area of the sphere is 4πr2. 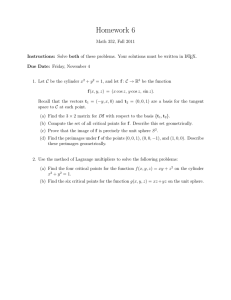 Math5700 Notes Chapter 10 Notes—Area dimensionality! 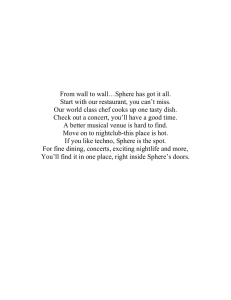 From wall to wall…Sphere has got it all.